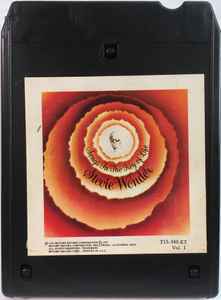 Black "Lear Jet Stereo 8" style 3-pin cartridge with "The Motown Sound" molded on the back. My copy of Vol 1 has a somewhat unique "error" in that I have this tape as-is mirroring this entry, but the sticker (that matches this entry) is stuck overtop a similar sticker indicating "T13-340-ET" on the tape front/spine. Only noticed as the "real" sticker began to peel after losing some stickiness of the glue. Again, my copy is this version with no edits or corrections, but I found it interesting it has a "correct" sticker overtop what appears to be an initial sticker error.